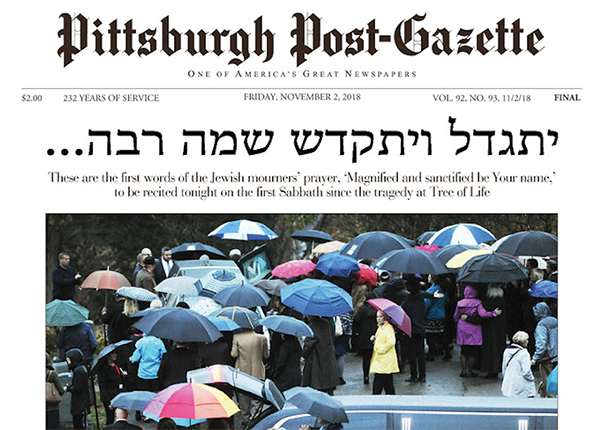 After the tragedy, North Shore native David Shribman decided to print the mourner’s Kaddish in Hebrew on the front page of the Pittsburgh Post-Gazette. 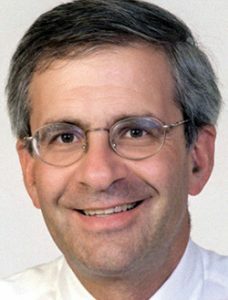 NOVEMBER 15, 2018 – David Shribman, who grew up in Swampscott and won a Pulitzer Prize while at The Boston Globe, is now the executive editor of the Pittsburgh Post-Gazette. He oversaw the newspaper’s coverage of the shooting at the Tree of Life Synagogue in the Squirrel Hill neighborhood of the city. As the community grieved, he wrote a headline that was seen and praised around the world: it included the first four words of the mourner’s Kaddish, in Hebrew. Here are some of his thoughts on the tragedy. Q: Your paper printed the first four words of the mourner’s Kaddish in Hebrew on the front page last Friday. When did you decide to do that, and why did you choose the Kaddish for a headline? A: I began to think that when there are no words to say, maybe we have been thinking in the wrong language. I decided to do that headline about two days before it appeared. I went back over to Squirrel Hill to meet my own rabbi to ask for help in the Hebrew letters and then to shape the sub-headline.  I had some advice not to do it. I am glad I did. I wrote many of the headlines that week, but in truth the last headlines I wrote [previously] were for the elections of Trump and Obama. I’m going to retire from that function. There are people around here who do it better than me. Q: As a journalist and editor of a major U.S. paper, how do you separate your own emotions – you live in the neighborhood where the shooting took place – from covering such a tragedy? A: My reaction will be no different from that of anyone else in our newsroom. We had a job to do, and we needed to do it quickly and well. Think of the Annapolis newspaper after the shooting. One of their reporters said: ‘We have a damn newspaper to put out.’ So did we, in the face of great tragedy of our own. Q: You’ve covered and overseen a lot of breaking stories in your career. Could you share what you learned about your community, and Judaism, from covering this tragedy? A: I (re)learned what I already knew: That this was a very Jewish neighborhood in a remarkable city where tolerance is the creed. One can never be ready for an event like this. But in a sense Pittsburgh was. All of the lines of communications among the faiths were in place; there was no need to improvise. We have been talking about interfaith issues for years. It didn’t start when the shooting ended, and that is what separates Pittsburgh from so many other places. Q: Anti-Semitism is one of the major issues facing Jews in America. How will you continue to cover this story, within the context of a changing America? A: We haven’t had time to think the big macro thoughts. Right now we are covering the news and, for many in this newsroom, grieving. We’ll think some big thoughts another day. But not this afternoon. Q: How has this impacted you a Jew? A: I have a Catholic wife from Buffalo. I’m a Jew from the North Shore. Our reactions were no different. I have one daughter in rabbinical school, another in the arts. Their reactions were no different. Q: How is your family holding up? A: We’ve been better. We are not better yet.